TheProCamera is happy to announce TheProCamera Nikon D3300 DSLR Camera Giveaway from which you can win Grand Prize of Nikon D3300 DSLR Camera or Second Prize of 32 GB SanDisk Compact Flash Card (Refurbished) or Third Prize of 4 GB Transcend Compact Flash Card (Refurbished). Total 3 Winners (1st, 2nd, 3rd) will be chosen and get 1 out of 3 TheProCamera Giveaway Prizes. So hurry up and enter now! TheProCamera.com is a Camera Guide Website which provides Camera Reviews and help you buying Perfect Camera. 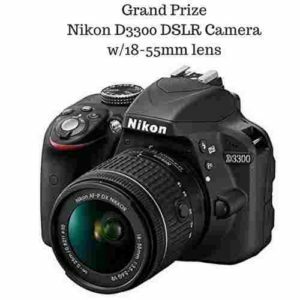 In this TheProCamera.com Nikon D3300 DSLR Camera Sweepstakes, 3 Winners will be selected through random system and get First Prize / Second Prize / Third Prize. Below is the Complete List of Giveaway Prizes. There are Total 3 Prizes to be won. The TheProCamera.com Nikon D3300 DSLR Camera Giveaway is only open to legal residents of the United States who are atleast 18 years of Age.